World Cup Bite Victim: Suarez's 4-Month Ban Is "Excessive"
Uruguay's star striker Luis Suarez was banned for four months for biting Italian player Giorgio Chiellini's shoulder during their decisive World Cup match. Uruguay's Luis Suarez, left, was banned from soccer for four months for biting Italian player Giorgio Chiellini, right, during their decisive World Cup match — a punishment Chiellini thinks is excessive. The Italian soccer player whose shoulder Uruguayan rival Luis Suarez bit during their decisive World Cup match this week thinks he's been punished too harshly for it. FIFA banned Suarez from all football activities and stadiums for four months, suspended him from Uruguay's next nine internationals and fined him for chomping down on Giorgio Chiellini's shoulder Tuesday. "Now inside me there are no feelings of joy, revenge or anger against Suarez for an incident, which happened on the pitch and is done," Chiellini wrote in his blog for Sportlobster. 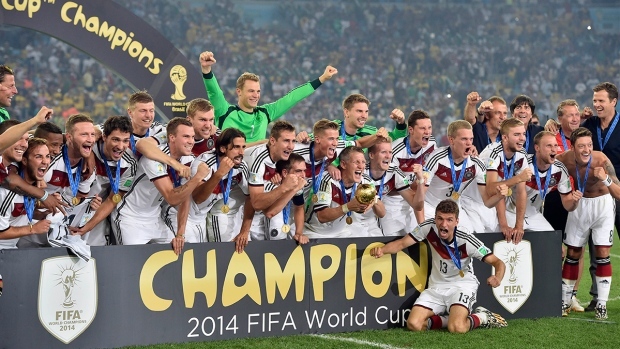 "There only remains the anger and the disappointment about the match. At the moment, my only thought is for Luis and his family, because they will face a very difficult period. "I have always unequivocally considered the disciplinary interventions by the competent bodies, but at the same time I believe the proposed formula is excessive. I sincerely hope he will be allowed to stay close to his teammates during the games, because such a ban is really alienating for a player." Uruguay's football federation said it planned to appeal the ban, which leaves it without its star striker and leading goalscorer for next year's Copa America, and most likely for the start of its qualifying matches for the 2018 World Cup. 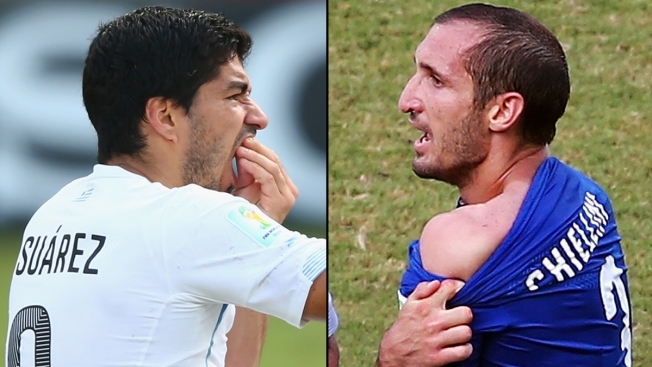 Suarez bit Chiellini's left shoulder during a 1-0 win against Italy in the group stage on Tuesday.